This outstanding example of a 2018 Dodge Charger SXT Plus is offered by WCG Enterprises. This Dodge includes: BEATS AUDIO GROUP Premium Sound System DRIVER CONFIDENCE GROUP Power Mirror(s) Heated Mirrors Blind Spot Monitor Cross-Traffic Alert POWER SUNROOF Generic Sun/Moonroof Sun/Moonroof WHEELS: 20" Aluminum Wheels ENGINE: 3.6L V6 24V VVT (STD) V6 Cylinder Engine Gasoline Fuel NAVIGATION & TRAVEL GROUP HD Radio Navigation System AM/FM Stereo Satellite Radio SUPER TRACK PAK Fog Lamps Transmission w/Dual Shift Mode Tires - Front Performance Aluminum Wheels 4-Wheel Disc Brakes Rear Spoiler Traction Control Adjustable Steering Wheel V6 Cylinder Engine Tires - Rear Performance ABS Gasoline Fuel Stability Control PITCH BLACK CLEARCOAT *Note - For third party subscriptions or services, please contact the dealer for more information. * CARFAX BuyBack Guarantee is reassurance that any major issues with this vehicle will show on CARFAX report. Looking for a one-owner vehicle? You've found it. CARFAX shows this vehicle was owned by the original buyer. Clean interior? How about flawless. This Dodge Charger looks like has never been used. 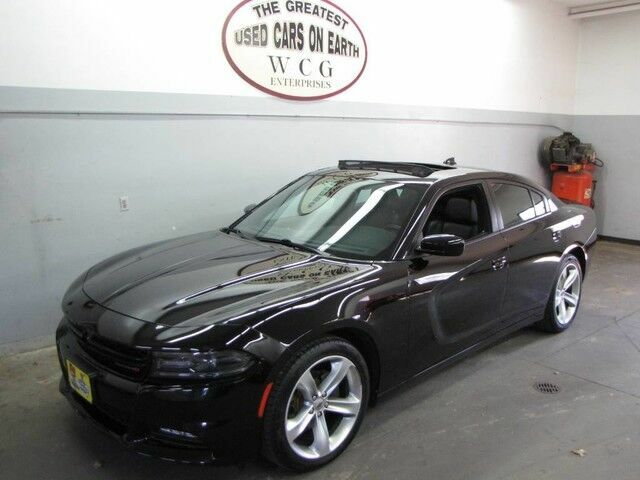 This Dodge Charger SXT Plus is covered under the Dodge reliable & trusted factory warranty. So, if you're in the market for an incredible vehicle which provides the manufacturer-backed assurance that everyone deserves, then this is the vehicle for you. Intricately stitched leather and ergonomic design seats are among the details in which test drivers say that Dodge Charger is in a league of its own This Dodge Charger offers the most up-to-date navigation system available so you'll always know the most efficient route to where you are going. The standard wheels have been upgraded to gives this vehicle a whole new style.